It's been a couple of months since my last post. My reason? I took a new job! I'm now an Assistant Professor in the Safety and Health Management Program (Department of Engineering Technologies, Safety, and Construction) at Central Washington University. At the very end of August, we packed up our meager belongings and Alaskan Malamute and drove up to Ellensburg, WA. The campus is gorgeous, with red brick buildings throughout, grassy areas, a canal, several bike paths, and my personal favorite location: a Japanese Garden (video tour on YouTube here). There is also a Starbucks on the edge of campus, so I can walk over within 10 minutes. Ellensburg is also a spiffy college town - the weekend after we arrived, it was the annual Ellensburg Rodeo for all of Labor Day weekend. This rodeo started in 1923, so it is one of the oldest rodeos. Where we used to live, in Prescott, AZ, they have had a rodeo since 1888 and rock the "World's Oldest Rodeo" vibe throughout town. 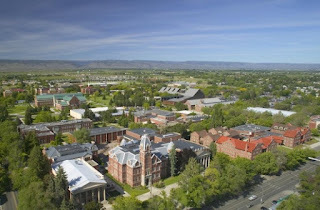 Ellensburg is a town of ~18,000 people and the speed limit around town ranges from 20-35 miles per hour. After our experiences in Phoenix the last few years, with a population of ~1.5 million people and some really aggressive drivers, this has been a nice change. Seattle is about 2 hours away, and Spokane is 2.5 to 3 hours away. My colleagues and family keep asking how we are adjusting to life in the Pacific Northwest. My answer is usually congenial, something along the lines of: "It's ... fine?" We haven't explored around much and I have been working consistently long hours, as is expected when you are new faculty. Last week, when we had our first real snow, I freaked out a little bit, but have since learned how to drive in snow (with my fancy new snow tires), how to walk in snow (with my fancy new YakTrax), and learned the value of layered clothing. We raided the Columbia outlet in Anthem, AZ on our way out of Phoenix. 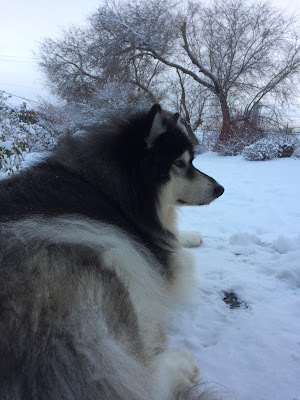 The Alaskan Malamute is deliriously happy, building himself little dens in the fresh snow, and bounding inside covered in snow flakes. We are deliriously happy to not have to answer the "How does he do in the summer? Do you shave him?" questions we were asked by everyone in Phoenix. (He did great, he's an inside dog). Shadow practicing his best "stoic" look in the snow. I'm preparing some exciting new content for the blog over winter break. But I'm also working on two academic research papers, one on construction project EHS budgets and the optimal budget amount for reduced injury and illness rates (co-writing with two excellent CWU professors), and one on "Practical Tools for Gender Equal Protection in OSH Programs" that will be presented at Safety 2017 in Denver, CO.
On a professional note, I've had some fun new volunteer experiences arrive this fall/winter: (1) I was elected the Assistant Administrator of the Training and Communications Practice Specialty within ASSE, (2) I was asked to step in as Secretary of the Industrial Hygiene Practice Specialty within ASSE, and (3) I get to serve on the Editorial/Press Advisory Board for the National Safety Council. So things are very busy for the Industrious Hygienist, but as always, I am up for the challenge!